In the last 30 years, the number of nearsighted Americans has increased dramatically, by 66%. Nearsightedness, or myopia, is the inability to focus on distant objects. In the early 1970s, 25% of Americans were nearsighted. Now, says epidemiologist Dr. Susan Vitale of the National Eye Institute, 42% of Americans are nearsighted. Does too much reading cause nearsightedness? Scientists have believed for decades that nearsightedness is caused by genetics (family history) and the amount of "near-work" that a person does, such as reading. For Americans, that could include watching TV and playing video games. Dr. Don Mutti, an optometrist at Ohio State, says, "Kepler wrote...400 years ago, that he thought his nearsightedness was due to his intense study of astronomical tables and so forth." Dr. Mutti has been researching the causes of myopia. For the past 20 years, Dr. Mutti has followed a group from childhood to adulthood, tracking their habits to see who develops myopia. Heredity does, to a large degree, influence who will become myopic later on. But Dr. Mutti has discovered something else, something surprising and unexpected. In his study, the amount of "near-work" such as reading and watching TV did not predict who would be nearsighted later. Said Dr. Mutti about his most current research, "near-work had no influence at all". What did predict nearsightedness was the amount of time spent indoors vs. outdoors during childhood. Said Dr. Mutti: "If you have two nearsighted parents and you engage in a low level of outdoor activity, your chances of becoming myopic by the 8th grade are about 60%. If children engaged in over 14 hours per week of outdoor activity, their chances of becoming nearsighted were now only 20%. So it was quite a dramatic reduction in the risk of becoming myopic." This could seem to support the "near-work" theory - if you're not outside, then you must be inside reading or watching TV. But Mutti looked at that possibility, and ruled it out. Mutti looked at exercise too, and ruled that out as well. Children exercising indoors did not get the same benefit of better vision as children spending time outdoors. Mutti is now conducting a study to test his suspicion that outdoor light levels may be responsible, that outdoor light may have a beneficial effect on the eye. He suspects that outdoor light may change some aspects of retinal physiology. Sounds good to me. Daylight can save energy, as well as possibly preserving our vision. In fact, one of the most cost-effective changes a school can make toward saving energy is using natural daylight to illuminate classrooms. See Jeff Barrie's award-winning documentary "Kilowatt Ours" or the article on Treehugger to learn more about schools that have made the move to natural daylight, and have saved money and reduced their carbon footprint by doing so. Could these progressive schools be protecting eyes and protecting the planet at the same time? Susan Vitale, PhD, et al. December 2009. "Increased Prevalence of Myopia in the United States Between 1971-1972 and 1999-2004." Archives of Ophthalmology 127(12):1632-1639. Deborah Amos. January 11, 2010. "Medical detectives focus on myopia". Morning Edition, National Public Radio. 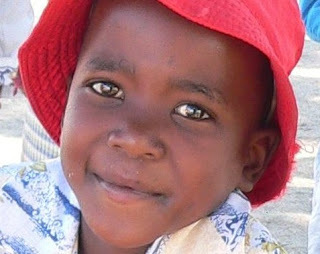 I took the photo of the child above in the village of Welverdiend, South Africa. A few of my previous posts about Welverdiend are "An African village seeking solutions" and "African village of Welverdiend believes in the power of good" and "My visit to a traditional healer". Enter the word Welverdiend in this blog's search window to find more about visiting the village.